Biryani is one of my most favourite meals. I absolutely drool over chicken biryani and love eating it while watching any favourite show on tv! 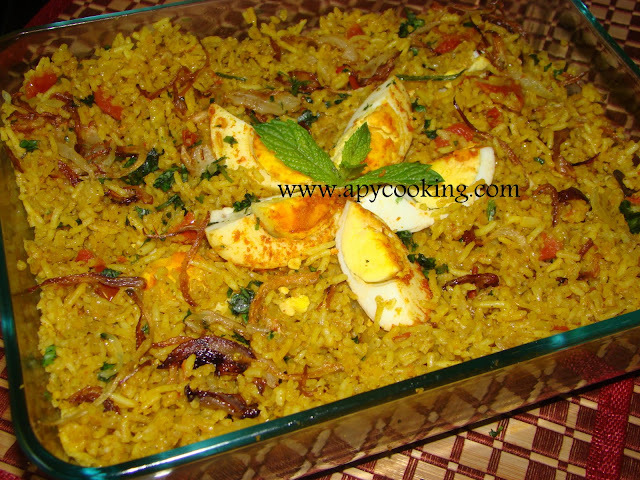 Today I made egg biryani for my husband's potluck party in his office. A few years back a friend had given me a basic recipe for biryani. Over the years I tweaked it and tried to bring in new flavours. Star anise, for example, lends a great flavour to your rice, so try to get your hand on it. Also, fried onions add a distinct taste to the biryani, so if you can forget about counting calories for a meal, go for it. However, the ingredient that lends the most flavour is ghee. 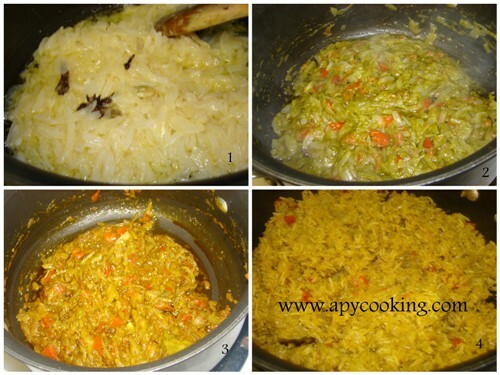 Go a little liberal on ghee and your biryani will smell and taste great! 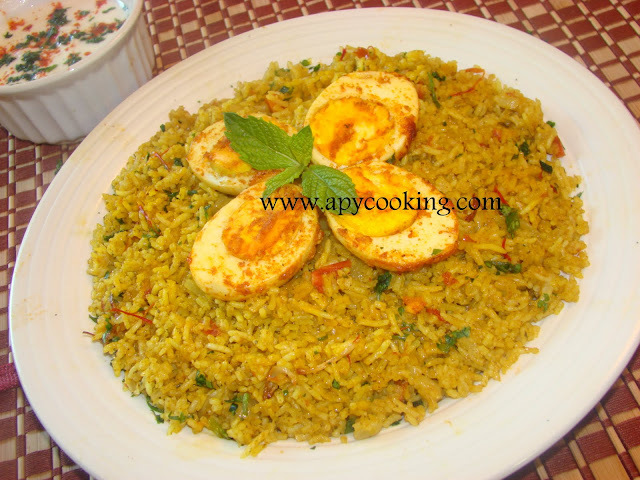 This recipe is almost a one-pot meal - the rice is not cooked separately. I actually prefer this method since I feel it captures the flavours better and brings all the elements together. The eggs are, ofcourse, boiled separately. Before you start making biryani, or any other flavoured rice for that matter, soak the rice completely in water for 20 to 30 mts. This way the rice will not break when you mix it and the grains will look longer. Soak basmati rice in water for atleast 30 minutes. [At this point you can start chopping your onions etc and start cooking so by the time you get to the point where you have to add rice, it will be atleast 30 mts]. In a large deep-bottomed pan, heat oil + ghee. Add bay leaves, cardamom, cloves, cinnamon and star anise. Add chopped onions and ginger garlic paste and sauté until onion turns brownish. Meanwhile grind corainder leaves, mint leaves, green chillies and yogurt into a paste (without water). Add this paste to the onions and roast for 3 to 4 minutes. Add chopped tomatoes and sauté till tomatoes are completely cooked. Sprinkle turmeric powder, garam masala powder and chilli powder (adjust according your spice level) and mix well. Drain the water out of the rice completely and add. Roast the rice for half a minute. Now add 3 1/4 cup hot water. [If you did not pre-soak the rice, add 4 cups water]. Add salt and mix [it has to be slighlty salty to accommodate the rice]. Cover, turn the flame to medium and cook for 10 to 12 minutes. The rice should be about 95% cooked. [Check after 9 to 10 minutes, if you feel the bottom is likely to burn, add a few tablespoons of water. If you are not comfortable cooking this way, you can use a rice cooker or pressure cooker]. Turn the gas off, mix gently, cover and leave untouched for another 10 minutes till the rice is completely cooked. At this point you can add the boiled eggs and serve. Or you can spice up the eggs a little bit. 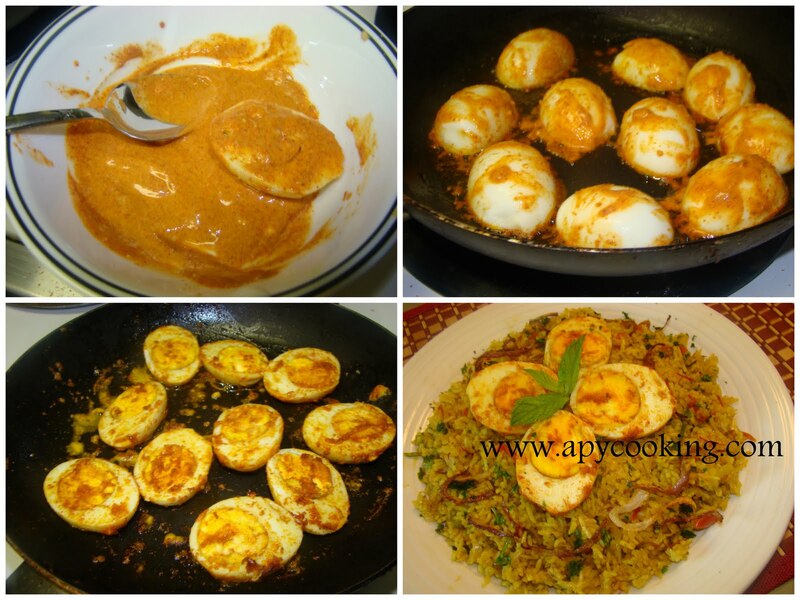 To do that, in a bowl mix 1 tsp chilli powder, 1/2 tsp garam masala powder and 1 pinch turmeric powder. Add 1 tsp ginger garlic paste, 2 tbsp yogurt and salt to taste and mix well. Heat oil in a wide skillet. Dip eggs in the above mixture and roast for few minutes on both sides. Take a large microwave-safe bowl. Spread some rice at the bottom. Layer with a few egg halves. Layer with rest of the rice. Place the remaining eggs on top. Garnish with 1/2 cup of fried onions and 2 tbsp coriander leaves. You can also drizzle some saffron water on top. Mouthwatering here, seriously drooling over that incredible,flavourful briyani..
Oh my god... no wonder briyani is always given a royal treatment... Your dish is so fabulous.. Delicious looking egg biriyani. Looks so delicious and mouthwatering.